After I mentioned to my readers in a previous political watch blog to keep an eye on the race for Texas Governor, I did not anticipate writing about another race. But I witnessed as Houston Council Member Jarvis Johnson made what I consider a bold challenge. So I had to blog about this one. On Tuesday, January 5, 38-year-old Council Member Johnson stood outside the historic George "Mickey" Leland building to announce that he is officially running for Houston's 18th Congressional District seat. “We're going to have a frank discussion on who's capable of bringing and creating good-paying jobs for the people of the district,” said Council Member Johnson, who was joined by a lot of supporters who stood behind him in the slightly cold weather. 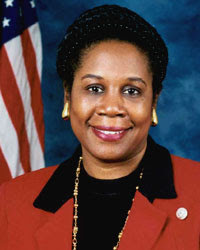 For my blog readers who don't know, U.S. Rep. Sheila Jackson Lee has held this seat in the 18th Congressional District since 1994. She has a long history of service and there's conflicting local views about her. Many like to note that she chose to back Hillary Rodham Clinton during the 2008 Presidential race. But that doesn't mean this race isn't going to be a battle. Voters ultimately have to decide. “I respect every one of my opponents. I know they will be putting forward their message. My message is one of results,” said Rep. Jackson-Lee said in news report. Yesterday, I saw as the local media tried to lure Council Member Johnson into attacking his opponents, which also includes Attorney Sean Roberts. But he stuck to the issues and how he plans to better the communities in the district. In his statement, Council Member Johnson pointed out the escalating school dropout rates in the 18th District and said "over the course of the next two months, I look forward to having a spirited debate on who can best represent the people of the Eighteenth Congressional District. "I have the energy. I have the youthful exuberance. I have the legs and the strong back to get out there and get the word out about what our campaign and candidacy is all about," he said. Interestingly, Council Member Johnson took the oath of office for his third term in City Council on January 4 and on that very same day he went to the headquarters of the Harris County Democratic Party, where he filed to become a contender in the March 2 Democratic primary. People will be watching this race very closely. I will too! But the real question is, will you vote?